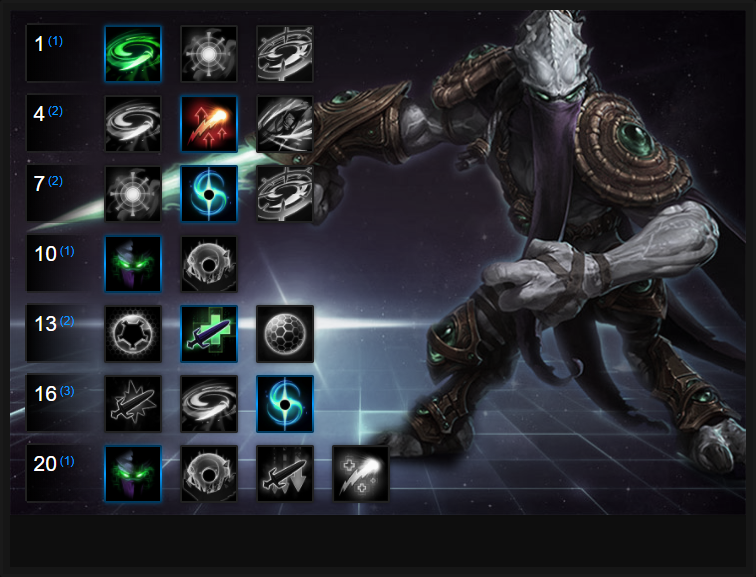 In this Zeratul Build Guide, we provide an overview of his strengths, abilities and talents. Zeratul is undoubtedly one of the strongest Heroes in Heroes of the Storm. As a Hero capable of cloaking, he's in an incredible position to not only roam a battleground freely, but also pick his target with accuracy and precision. Unsurprisingly, Zeratul is incredibly weak if out of cloak and so it's important to position yourself right for every fight as if you're caught out, there's every chance you'll die. What also makes Zeratul a formidable Hero is the fact he has one of the best Heroic skills in the game. Void Prison is capable of preventing player action for a period of time, allowing you to freeze out certain Heroes to then spike when they are released from the prison, or to also protect structures or prevent entry to a specific area. Finally, Zeratul has one of the highest single target bursts in the game next to Nova, so he's a brilliant counter to just about any assassin that's low health. Weaker against compositions that are particularly "tanky"
Permanent Cloak (Trait) - Acting similarly to Nova's, Permanent Cloak allows Zeratul to remain invisible whilst he is stationary. If he uses any ability, he'll reveal himself. While moving, he has a faint outline and can be "popped" out of Stealth by AOE abilities. The main thing to be aware of with Permanent Cloak is the fact that it takes 1.5 seconds to turn Invisible after standing still (this is indicated by a visual effect around your screen). Active Ability (1) - Vorpal Blade is baseline for Zeratul and is an additional active ability (similarly to Xul's Bone Shield). It allows Zeratul to teleport to any target he has attacked, within the last 3 seconds. Even if that Hero has flown away (Falstad) or has teleported (Gul'dan). What makes Vorpal Blade so powerful is that it ensures Zeratul is particularly "sticky", especially when he also has Blink available. Cleave (Q) - Cleave is a low cooldown burst ability that provides a solid amount of AOE damage to those around Zeratul. It hits hard and is good for clearing minions, but also for dealing additional damage to enemy Heroes who are grouped up. It's your primary attack and typically, you should always open with it. The low cooldown ensures that after a complete rotation, it's typically ready again for a second use. Singularity Spike (W) - Singularity Spike allows Zeratul to fire a ranged object at an enemy. If it hits them, it deals delayed damage, but also slows them by 40% for 3 seconds. It's incredibly good at allowing you to follow up with another burst after your opener, and great for preventing players escaping. Just be sure to land it, as it integral to keeping enemy Heroes pinned down. If you can, launch it immediately after your Cleave > Basic Attack > Singularity Spike. Blink (E) - Blink is the only gaurenteed means of escape or engagement for Zeratul. It's also fundamental to his survivability and playstyle. With a 10 second cooldown, it's fairly lengthy but it's also - for the most part - a gaurenteed escape. If an attack goes wrong, simply Blink away. Alternatively, Blink towards a target to finish them off if they're trying to run (if Vorpal Blade is on cooldown). Just be aware that if you don't have Blink ready, it's not worth engaging unless you can gaurentee the kill. Please also note that Blink allows you to pass over scenary. Might of the Nerazim (R) - There are two parts to Might of the Nerazim. The first is the ability to instantly re-cast your last ability on activation. The second is your next basic attack will automatically deal 40% more damage, for 6 seconds, after each ability use. It allows Zeratul to deal eye-watering burst, especially if he rotates his abilities and basic attacks. A typical rotation at level 20 would be: Singularity Spike > Basic Attack > Cleave > Basic Attack > Might of the Nerazim > Basic Attack > Cleave > Basic Attack. The entire rotation takes about two seconds, and while it requires practice, can kill just about any Hero instantly. Void Prison (R) - Although its had its potency reduced, Void Prison is still incredibly powerful. Enemies caught in its field will be trapped in stasis, preventing all actions for 5 seconds. It's incredibly strong for temporarily disabling enemy Heroes, and also buying you or your team time to reposition. Its range is very short so there is significant risk to placing it, and if placed badly its cooldown is unforgiving. It's also worth noting that it can be used on your own Core to protect it from harm, even for a few seconds. Allowing Zeratul to increase his Cleave radius by 33%, Greater Cleave ensures he can wave clear easier, but importantly, soften up enemy Heroes without having to be immediately next to them. For when a Hero might normally just be out of range, Greater Cleave is invaluable when needing to just nip that last bit of damage against a target. Psionic Strength allows Zeratul to increase his damage by 6% every time he hits a Hero. Whether with a basic attack or ability, the 30% maximum bonus is easily obtained, and takes only seconds to achieve. It also helps when you snag multiple Heroes with Cleave, as this can often cap the bonus instantly. Just be aware that Psionic Strength is lost after 3 seconds of not hitting a Hero. Seeker In The Dark elongates the detonation delay of Singularity Spike by 50% but in its place, allows you to teleport to the target, granting 30% increased movement speed for 3 seconds. The mobility is excellent and it plays perfectly into your level 16 talent. Might of the Nerazim provides incredible burst potential for Zeratul, and ensures that he can not only make valuable use of Talents that modify his basic attack damage, but to also punish players quickly with back-to-back Cleaves. The passive damage bonus on your basic attacks is also huge, especially when paired with Mending Strikes and Sentenced To Death. Considering most of your damage stems from basic attacks, once your abilities have been used, and pairing in with Combo Slash, gaining 35% healing based on that damage is huge. Mending Strikes gives some much needed sustain against Heroes 1 on 1 and allows for easy camps. With the damage multipliers on basics, it heals for a huge amount. Anyone affected by Singularity Spike now grants Zeratul 40% increased damage against them. This is where Seeker In The Dark brings its value, because Singularity Spike also lasts 50% longer. It's an outrageous boost to your damage potential, with Sentenced To Death being a must. Effectively allowing Zeratul to reset his last ability used after using Might of the Nerazim, Twilight Falls provides the potential to use any ability 3 times back to back. A simple Cleave > Might of the Nerazim (Cleave) > Cleave is 2500 instant damage. These Hero Threat Levels (1 being lowest threat and 10 being highest threat) are to help you determine which enemy Heroes can give you a headache. Any Heroes that aren't on this list are easy pickings for Zeratul. If a Hero is listed here, take greater care. Johanna: With many of her skills being AOE (including her ranged blind and pull) she's really tough to deal with because she'll always break your Cloak. She's also so tanky you'll never kill her. Nova: Nova versus Zeratul is an interesting matchup. It's literally a case of who gets the drop on the other first. If you're exposed and you don't see Nova, try to escape ASAP as she'll be lurking to blow you up. The Butcher: His charge, Lamb to the Slaughter or self heal can rip you up in seconds. Even if you try to Blink, he'll have one of his crowd control skills waiting for you. Thrall: If he gets the drop on you with his root, you're going to take huge damage. His self healing also gives him good sustain against your burst. Raynor: His knockback combined with his self heal allows him to kite you fairly easily. Although you can still burst him down, it's best to only attack him when you know he has used his heal. Tassadar: His vision allows him to pop you out of Cloak at any time. He's a hard counter to you and if his team are protecting him, you'll struggle to kill him and still be revealed. This list of tips and tricks are just a handful of things we think will help your Zeratul. We'll continue to add to the list as required and if you have any tips you'd like to share, let us know in the comments below and we'll place them here. 1. You have to remain stationary for 1.5 seconds to become invisible as Zeratul. Try to be on time for objectives so you can lye in wait. 2. Stealthed Heroes are really easy to see when not invisible, but can’t be targeted by basic attacks. Try to use vents and bushes to mask your location. 3. It’s a good idea to reveal yourself after a team fight has started. Typically enemies won’t be looking for you, and you’ll often be able to snag kills on Heroes who have medium to low health. 4. Remember that Vorpal Blade teleports you directly next to the last enemy hit. It’s often a good idea to force an opponent to use their “escape” ability, only to have you immediately appear next to them. This ensures they’re then left with nothing to defend themselves with and if you need to, you can still Blink away. 5. Zeratul is pretty cooldown dependent so try to engage only when you have everything available. 6. If you have to, use Cleave to soak lanes. Even as a Stealth Hero, it’s still important to grab XP for your team. 7. Cleave allows Zeratul to takes merc camps fairly easily. Don’t be afraid to invade enemy camps and snag them. 8. Try to hit multiple Heroes with Cleave. Not only to trigger your Psionic Strength talent, but to also deal high AOE damage. 9. Singularity Spike is first and foremost a slow. Use it to pummel high value Heroes who you don’t want to escape. 10. Remember that with Talents, you can reactivate Singularity Spike to leap back towards your enemy. 11. Might of the Nerazim provides the opportunity to use any ability twice. You don’t have to use it just for damage. A double Blink is incredible for escaping or chasing. 12. If there is a Tassadar on the enemy team, always try to fight in other locations. If you have to fight near him (due to a team fight) wait until you know he's used his trait or engage only when he's busy. 13. Always try to focus high damage Heroes: Valla, Kael'Thas, Jaina and Illidan. 14. Remember you always want to use a basic attack after every ability for maximum damage. Thanks for reading our Zeratul guide! You can now help support Ten Ton Hammer, so we can keep writing guides like this.